While the CIA relies on cartoons to sell itself, the Taliban go from person to person, proving that technology was no substitute for human contact. Ultimately, the United States was defeated in Vietnam for just this reason, notes Douglas Valentine. After waging an eight-year “dirty war” against the Taliban, the US government is acknowledging that the “insurgent” enemy is part of the “fabric” of Afghan society and is encouraging low- and mid-level Taliban defectors to switch sides. US and NATO officials are offering bribes drawn from a billion-dollar “Peace and Reintegration Trust Fund” to get Taliban fighters to defect. Taliban leaders have condemned the buyout strategy as a “trick” and warn that offers of reconciliation will be futile unless all foreign troops leave Afghanistan. Meanwhile, back in the United States, the gesture toward “peace” has resonated well with opinion leaders and with elements of the US public tired of war. But there is a darker side to such “reconciliation” plans. In the past, defector programs have been essential parts of brutal US pacification efforts. For example, the so-called Chieu Hoi “Open Arms” program in Vietnam is touted by US military strategists as having produced positive results by offering “clemency to insurgents.” But even the publicity surrounding the “Open Arms” program had an offensive, propaganda component, seeking to make “pacification” of the Vietnamese countryside appear more humane. Indeed, defector “amnesty” or “clemency” or “open arms” programs had little to do with genuine “reconciliation,” but rather were just one component of the overall, aggressive CIA intelligence and counterinsurgency operations. Master spy Colby, who died in 1996, would certainly have agreed that information management – language – is the essence of political warfare in general and defector programs in particular, not just aimed at the indigenous population in the field but also at the American body politic back home, which starts to see the war in a kinder, gentler light. Such cleverly crafted slogans may have no basis in reality. Instead, by appealing to American (if not Vietnamese or Afghan) sensibilities, these slogans serve as the first step in creating an aura of necessity around the violent repression of those Vietnamese or Afghans who won’t do the “reasonable” thing and come over to the American side. Apart from using Madison Avenue-style slogans, the CIA also garners public approval by composing and planting distorted articles in foreign and domestic newspapers. The stories often portray the CIA’s operations as pleasant-sounding Civic Action programs that are advertised as fostering freedom, patriotism, brotherhood, democracy. In CIA jargon, this manipulation of language is called “black propaganda” and is the job of political and psychological (PP) warfare officers in the covert action branch. “PP” officers played a major role in packaging the Phoenix Program for sale to the American public as a program designed "to protect the people (of Vietnam) from terrorism." Despite the warm and fuzzy language, these intelligence programs also have a nasty side. The CIA launches a covert action program like the Taliban defector program only if it is seen to have “intelligence poten¬tial,” such as collecting information on an enemy's political, military and economic infrastructure. Not only are defectors valued for their ability to sap the enemy's fighting strength and morale, but having worked on the inside, they can provide accurate and timely intelligence on enemy unit strength and location. They also can serve as guides and trackers, and after defecting, many are immediately returned to their area of operations with a reaction force to locate hidden enemy arms or food caches. Others defectors, after being screened and interrogated by security officers, are turned into double agents. Defectors who return to their former positions inside enemy military units or political organizations are, as Colby explained, provided with a "secure" means of contacting their CIA case officer, to whom they feed information leading to the arrest or ambush of enemy cadres, soldiers, and secret agents. Defector programs also provide CIA “talent scouts” with cover for recruiting criminals into counter-terrorist and political action programs. Burglars, arsonists, forgers and smugglers have unique skills and no compunctions about conducting brutal interrogations. In Vietnam, the entire 52nd Ranger Battalion of the South Vietnamese Army was recruited from Saigon prisons. Already, under cover of Civic Action, the CIA has been waging “a dirty war” against the Taliban using black propaganda, defectors, criminals, assassinations, selective terror, indefinite detention and a slew of other devious tactics disguised as bringing freedom and democracy, but in fact providing internal security for President Hamid Karzai and his corrupt regime. The CIA refined these practices in Vietnam, where it waged clandestine political and psychological warfare, often working within the US Information Service (USIS). Ostensibly, the US Information Agency had as its raison d'être the promotion of the "Amer-ican way." In its crusade to convert the world into one big happy Chamber of Commerce, the USIS employed all manner of “media,” from TV, radio and satellites to armed propaganda teams, wanted posters, and selective terror. Frank Scotton, a CIA officer under cover with the USIS, played a large role in political and psychological operations (psyops) in Vietnam. A graduate of American University's College of International Relations, Scot¬ton received a government graduate assistantship to the East-West Cen¬ter at the University of Hawaii. According to legendary CIA officer Lucien Conein, it was there that Scotton was recruited into the CIA. About the CIA-sponsored East-West Center, Scotton said, "It was a cover for a training program in which Southeast Asians were brought to Hawaii and trained to go back to Vietnam, Cambodia, and Laos to create agent nets." After arriving in Vietnam in 1961, and initiating his vast agent net, Scotton turned his attention to “energizing" the Vietnamese through political action that advanced American policies. In looking for individuals to mold into unilateral political cadres, Scotton turned to the CIA's defector program, which in April 1963 was placed under cover of the Agency for International Development and named the Chieu Hoi (Open Arms) amnesty program. There Scotton found the raw material he needed to prove the viability of CIA political action and psywar programs. In Pleiku Province, Scotton worked with Vietnamese Special Forces Captain Nguyen Tuy (a graduate of Fort Bragg's Special Warfare Center who commanded the Fourth Special Operations De¬tachment) and Tuy's case officer, US Special Forces Captain Howard Walters. As part of a pilot program designed to induce defectors, Scotton, Walters and Tuy set up an ambush deep in Vietcong territory and waited until dark. When they spotted a VC unit, Scotton yelled in Vietnamese through a bullhorn, "You are being misled! You are being lied to! We promise you an education!" Then, full of purpose and allegory, he shot a flare into the night sky and hollered, "Walk toward the light!" To his surprise, two defectors did walk in, convincing him and his CIA bosses that "a deter-mined GVN unit could contest the VC in terms of combat and propaganda." Back in camp, Scotton told the VC defectors that they had to divest themselves of untruths. The CIA’s security officer would oversee the Chieu Hoi Program in the provinces. If a defector had potential, the province security officer put him on an airplane and sent him to the central CIA re-indoctrination center, where he was plied with special attention and wowed with CIA gadgetry. The food was spectacular, full of protein, and the bullets weren’t flying. The training was vigorous, but the defectors were treated well, receiving medical care for infections while putting on weight. Other defectors would explain the beauty of the American Way, and other applicable lessons of the day. This brainwashing is "precisely" what political warfare is all about: Having been selected into a "special" program and given "special" treatment, defectors are taught the corporate sales pitch, cross-trained as interchangeable parts for efficiency, then given one last motivational booster shot of schmaltz. While sounding almost comical – brimming with the over-the-top enthusiasm of an Amway convention or a religious revival – these programs, in reality, were deadly serious business. Today, they are conducted secretly at high-security CIA bases in Afghanistan. All defector debriefing reports are certainly sent to the CIA station in Kabul for analysis and collation. Translations are, typically, never considered accurate unless read and confirmed in the original language by the same person, but that rarely happens. The defector program also will likely be exploited by Taliban secret agents, just as the Chieu Hoi program was penetrated in Vietnam. In June 1967, the CIA’s Chieu Hoi defector program was incorporated within its newly established Phoenix Program, as it was organized by CIA officer Nelson Brickham, who appreciated Chieu Hoi as "one of the few areas where police and paramilitary advisers cooperated." The Phoenix program was designed to coordinate all intelligence programs in South Vietnam so the CIA could better identify and neutralize Viet Cong political cadre. As Brickham said, “My motto was to recruit them; if you can't recruit them, defect them (that's Chieu Hoi); if you can't defect them, capture them; if you can't capture them, kill them." Brickham also emphasized that Chieu Hoi was a means for the CIA to develop “unilateral penetrations unknown to the [South Vietnamese] police." In other words, if the CIA follows a similar approach in Afghanistan, the Taliban defector buyout program would be conducted unilaterally by the CIA, apart from the Karzai government. From 1967 onwards, all "rallied" VC cadre were included in Phoenix neutralization statistics, and by 1969 more than 100,000 defectors had been processed through 51 Chieu Hoi centers. The Phoenix Program sought to resolve the “revolving door syndrome” by arranging through the SIDE (Screening, Interrogation and Detention of the Enemy) Program the construc¬tion of permanent detention facilities; a registration system coordinated with Chieu Hoi programs; and judicial reform aimed at the rapid disposal of pending cases, as devised by Robert Harper, a lawyer on contract to the CIA. From the language of the Phoenix reports, one could easily think that the Chieu Hoi program was a great success. But many Chieu Hoi defectors simply regurgitated the American line in order to win amnesty, make a quick visit to their families, enjoy a few home-cooked meals, and then return to the war for independence, fat and rested. Genuine Chieu Hoi defectors were pariahs who were not accepted back in their villages. Jim Ward, the senior CIA officer in charge of Phoenix in the Delta (1967-1969) described the Chieu Hoi defection process as follows: Upon arriving at the Chieu Hoi center, the defector was "interviewed" and, if he had information on the Vietcong infrastructure (VCI), was sent to the CIA’s Province Interrogation Center; if he had tactical military information, he was sent to military interrogators. Next came political in¬doctrination, lasting from 40-60 days, depending on the individual. "They had a formal course," said Ward. "They were shown movies and given lectures on democracy." Upon graduation each was given an ID card, a meal, some money, and a chance to repent. Despite his praise for the Chieu Hoi program, Ward said that "Amer¬icans should have been targeted only against the North Vietnamese and left the South Vietnamese forces to handle the insurgency," even though such a strategy would have precluded Phoenix. The same lesson applies in Afghanistan. In the eight-plus years of occupation, the US and NATO forces have come to be viewed by many Afghanis as occupiers responsible for the deaths of thousands of innocent civilians. So, the United States must rely on psychological ploys, rather than any appeal to nationalism, to win the Afghanis over to the American Way of doing things. That is how rewards and bounty programs have become business as usual. That is why the US is instituting a defector program, with a publicity campaign managed in the field by psyops teams replete with radios, leaflets, posters, banners, TV shows, movies, comic books falling from planes, and loudspeakers mounted on trucks to spread the word – much as happened in Vietnam. On Jan. 22, 1970, 38,000 leaflets were dropped over three villages in Go Vap District. Addressed to specific VCI members, they read: "Since you have joined the NLF, what have you done for your family or your village and hamlet? Or have you just broken up the happiness of many families and destroyed houses and land? Some people among you have been awakened recently, they have deserted the Communist ranks and were received by the GVN and the people with open arms and family affection. “You should be ready for the end if you remain in the Communist ranks. You will be dealing with difficulties bigger from day to day and will suffer serious failure when the ARVN expand strongly. You had better return to your family where you will be guaranteed safety and helped to establish a new life." 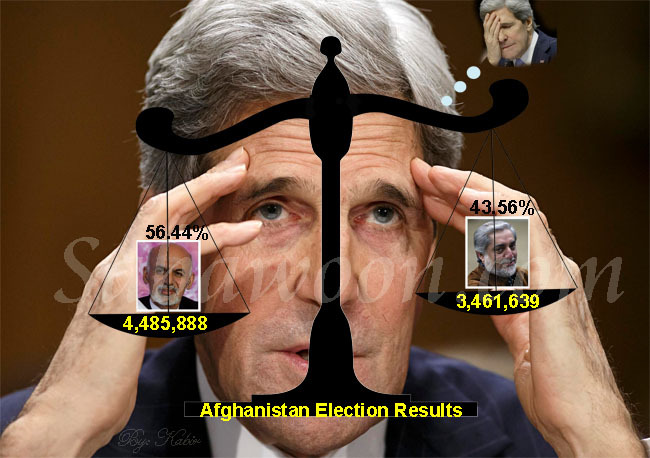 Similar psyops leaflets will be aimed at creating defectors in Afghanistan. The Taliban will be portrayed as a socially disruptive force that will inevitably lose. But the Americans can only reach the "people" only through "media" like leaflets and loudspeakers – an indication of just how far removed the CIA is from the reality of life in Afghanistan’s rural villages. And while the CIA relies on cartoons to sell itself, the Taliban go from person to person, proving that technology was no substitute for human contact. Ultimately, the United States was defeated in Vietnam for just this reason. Though packaged as a new initiative, the Taliban defector buyout program simply heralds a replay of the Vietnam experience in Afghanistan – nothing new in the grim world of counterinsurgency. Douglas Valentine is author of The Phoenix Program as well as The Strength of the Wolf and the new book Strength of the Pack. His Web site is DouglasValentine.com.